Crab Place gift cards are the perfect way to send seafood to family and friends. Mussels in Wine and Broth take about 2 minutes to cook once the water starts boiling. It's one of the fastest and tastiest appetizers around. I recommend serving this with your favorite crusty bread along with a pile of napkins. Not that it's all that messy but you really want to sop up all the liquid so you do need to get your hands into the bowl. Scrub the mussels and place them in a large bowl. Make sure to remove the beards from mussels and to discard all broken shells or mussels that won’t close. 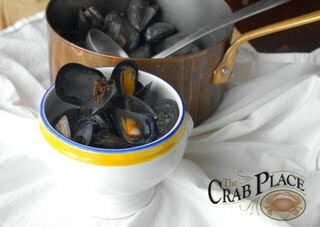 Fill the bowl with enough cold water to cover the mussels. Let the mussels sit for 20 minutes to purge any sand. Remove the mussels from the water and rinse thoroughly. In a medium stockpot add in the mussels, broth, wine, garlic, and butter and set it over high heat with the lid on. When the liquid comes to a boil cook until the shells open, or about 2 minutes. Serve immediately in 2 large bowls with the juices poured over. Offer slices of soft bread for dipping. Crab Claws: To Old Bay or J.O. ?